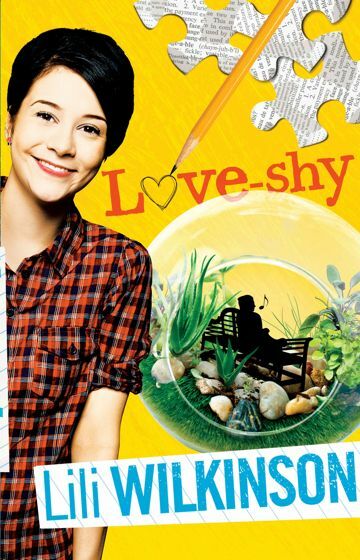 A few weeks ago, I was randomly picked by Lili Wilkinson to receive a copy of her new book Love-shy. I received my copy of Love-shy on Friday night, opened it up and couldn't put it down. I'm a slow reader, so 309 pages in 3 days is a good effort for me! Especially after completely reading Oleanna the night before. Anyway, Ms Wilkinson's book was amazing, engaging, funny and full of attitude and characters that I adored. Protagonist and aspiring journalist Penny Drummond discovers that a boy at her school suffers from love-shyness - which, yes, is a real condition - and sets out to find out who he is and help him, with plans to make a Pulitzer Prize-winning article about him. But along the way, not all goes according to plan. There is more to the love-shy boy than meets the eye, and Penny discovers some things about herself that she'd never realized before. Another awesome thing about this book is that Lili Wilkinson is an Australian author, and I'm digging a lot of the humour that's been used to help make this story great. Love-shy was published by Allen & Unwin this year. Has anyone else read this awesome book yet? Do it! Oh this sounds really good! Maybe it will join my ever-growing list to to-be-reads. Thanks, Bonnee! :) Do it. I LOVED it! Sounds great!! Thanks for the info!! Yeah, he is cute isnt he!! One of the advantages of being related to me!! LOL Just kidding!! I don't read much, prefaring to us emy spare time on writing. But I like the topic of a boy who is shy in love. Don't recall any YA books with this topic. I notice many YA authors in the US getting together to form a blog. You probably notced some of them. It'll be cool for YA aussie authors to join for a blog. Ooh which other book did you read? I want to get my hands on some more of her stuff, seeing as I really enjoyed Love-shy.